Hot Yoga Downtown | Knapsack Creative Co. When our next-door neighbor Sarah came to us with a few questions about how to update her old website, we took a look and quickly realized that it was time for a site rebuild. It had been several years since the last site was built, and we knew we could build a new mobile-friendly site on Squarespace that would be easier for her to manage and would enable more online class sign-ups. Sarah gathered photos of the studio, her logo files, and wrote up a rough draft of their website content. A few weeks later we sat down together in our office one morning to build out the new site. We chose the Bedford template, placed all the text content, placed photos, and created a stylesheet to choose colors and fonts for the new site. 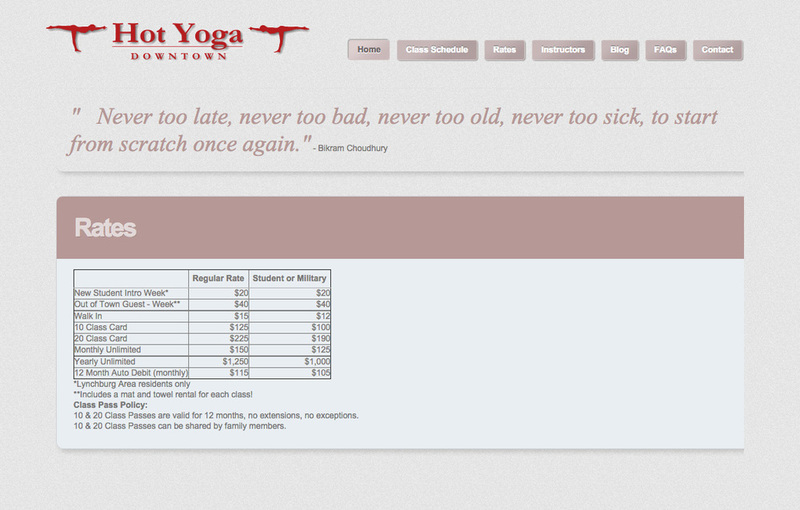 Next we made a class schedule and signup page using her MindBody account and the HealCode widget. The goal was to make it as easy as possible for her customers to sign up for a class whether they were sitting at their computer or on their smartphone. Since we finished the new site by mid-afternoon we decided to add one last touch. We worked together to redesign the Hot Yoga Downtown logo to make it more sophisticated, clean, and modern. If you're looking for a Yoga studio in Lynchburg, VA, we highly recommend signing up for a class at Hot Yoga Downtown.